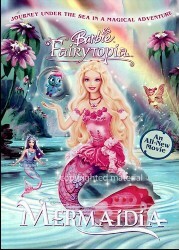 Plot Outline: In Barbie: Fairytopia, the wingless flower fairy Elina defeated Laverna, the evil sister of the Enchantress, and the Enchantress gave Elina wings as a reward. This film's plot begins shortly afterward with Elina flying through the air, still having trouble believing that she has wings. Soon, Elina learns from a young sea-butterfly fairy that her friend Nalu, the merman prince, has been kidnapped by several of Laverna's Fungi at the Crystal Cove. The banished Laverna is seeking out the Immunity Berry, a berry that causes whoever eats it to be immune to all magic. Since Nalu knows how to find the berry, Laverna had sent her Fungi to force Nalu to lead them to the Immunity Berry.